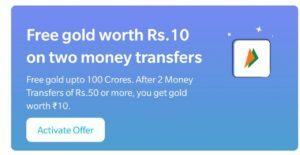 Paytm FREE30 Gold Loot – Paytm Digital Gold enables customers can buy 24K 999.9 Gold from MMTC-PAMP and store it in the country’s most secure 100% insured vaults for free. Paytm’s recent gold offer NEW30 / NEW40 was a bang, Now paytm has introduced FREE30 Promocode, you can avail this code in new paytm account with no transactions & Avail the benefits. Here I am mentioning every step which will be helpful for grabbing your free gold balance worth Rs.30 in your PayTM Digital Gold Wallet. You just need a New Paytm Account in which you must have atleast Rs.40 to activate this offer. How to Avail Paytm Gold Promocode – Paytm FREE30 Gold Loot? Now Register with your Mobile Number. Make payment of Rs.0. That’s it! Your Rs.30 Goldback will be added to your account. Transfer to your main account/bank. Click on the above link to visit script page. How to Use the Above Script? 1, First Of All Just Sign in into Your PayTM account on Website or App. 3. Scroll and search for “Free Gold Worth Rs.10 on Two Money Transfers” offer. 4. Now click On Activate this Offer. 5. Make 2 UPI Transactions Of Minimum Rs.50 From Your PayTM UPI into Any other UPI Address. Offer is Valid Till 31st March 2019 . For New PayTM Users There is another Free Gold Offer is Going On Worth Rs.30 , Follow Below Mentioned Steps to get it.